Take two laboratory rodents, jack them up on narcotics for “scientific” research and what do you get? 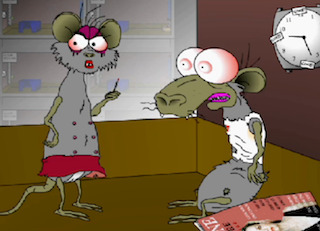 Well, you get the sheer, intense insanity of Dean Packis‘ animated web series Rats on Cocaine. It’s kind of like Pinky and the Brain starring Sid Vicious and Nancy Spungen. Embedded above is Episode 4: Maze in which the rats Cage and Alice are tested to see if they can sniff out their favorite kind of nose candy. And, if you haven’t realized it yet, this cartoon is NSFW and absolutely not for children. I decided to specifically post this episode up instead of one of the others I watched because I liked how, in the middle of all the grotesqueries and foul language on display, Packis drops in several random, innocent 8-bit video game jokes. I have to love any animation that, at the same time, can both offend my senses and make me nostalgic for my childhood when I wasted many a day playing Atari’s ridiculous Adventure game. That’s a feat to be applauded. But, I also like how Packis really puts us in the rats’ world and state of mind, particularly how befuddled they behave when they’re initially dropped into the maze. Clearly, as humans, we understand where they are and what they’re being tested for, but the rats don’t get that they’re even being given a test. They accept their fate without questioning it, and their singular drive is to score some coke. The series also has the familiar trappings of classic sitcoms. I’m going to assume that naming the female rat Alice is a nod to The Honeymooners. And while the opium addicted gerbils don’t share similar personalities to Ed Norton and Trixie, they do fulfill the “wacky neighbor” quotient of the sitcom format. Packis has completed 10 episodes of Rats on Cocaine, all of which are available to view on Vimeo. However, the filmmaker is way more prolific than that and has produced several web series over the years, including Premie Petey and Father Tucker, plus many one-off specials. All of these can be found on his website, Apocalyptic Cartoons.